The first of four planned events for 2019 for the Preston Arms Fair was very well attended despite the cold and wet weather, and it’s fair to say all who stood the fair and those visiting the event had a great day. The fair is attracting both dealers and visitors from London, the West Midlands, Yorkshire and the North East England etc thus giving visitors a diverse selection of artifacts perhaps not seen before at our fair. The pictures from the 3rd March show the fair in full swing and as usual the visitors came in a steady stream all day until well after 2pm. The winners of the £ 50 dealers raffle were Ross and Denise from Retrospect at Barnoldswick who had not started to strip their table down when the raffle was drawn. Our next fair will be held on Bank Holiday Monday the 27th May 2019, the event is almost fully sold out now ! We look forward to another superb Arms and Militaria fair and we hope to see you all there again…and as always drive carefully and the very best of luck in finding that special artifact for your collection ! All the best from all at the Preston Arms Fair. The November Fair was the final venue for this year and it proved to be very well attended and the feedback from visitors and dealers alike was excellent, all tables had been booked and with a number of new dealers there was a wide variety of Military collectables available to buy, sell or exchange. The £ 50-00 Dealers Raffle was won by Nick the Knife, well done Nick !! As always drive safely and see you in March ! Our third fair of 2018 fell in the midst of one of the hottest summers in memory yet we still maintained our excellent footfall record, visitors where still arriving after 2pm ! We had several new dealers with us all had a superb day with us and all booked for the November fair. Due to the changes regarding access to the Park Hall Hotel from the Charnock Richard services, after several different scenarios the restrictions were limited to the Northbound services where full barriers have been erected. Our last fair of the year will be held on Sunday the 4th November when we look forward to a superb event. Where did the year go? Christmas is in view !! As always, best of luck finding those special items for your collections and see you soon…Take care on the roads ! The first fair of the new year coincided with the worst storm in the UK for almost ten years ! On the Friday it looked like there would be no fair but in many areas it eased and most of our dedicated dealers did make it to the venue, however six dealers were either in the North East or the West Midlands and travel was impossible. It was four months since our last fair and the weather was no obstacle to the excellent visitor turnout and we had a really good fair with all the dealers we spoke to reporting a superb day. As usual we had the Dealers Raffle, this time two prizes of £40 instead of the normal £50-00, these were won by Martin Short and Mick Stott, very well done lads your tables were as you had them throughout the day, as everyone knows to win having started to dismantle tables means disqualification ! Our last Arms and Militaria Fair of the year, held on the 5th November , proved to be a great success with very favorable comments from very many dealers and collectors. There was a steady stream of people visiting all day from opening and were still coming in after 2pm making the fair one of the best attended of the year. The Dealers Raffle was won by Fred Greenwell….Well done Fred ! We will be maintaining four fairs in 2018, March, May, August and November. With Christmas and the New Year just around the corner ( Where did the year go ?) we would like to wish all our dealers and collectors a superb Christmas and a Happy and Prosperous New Year of 2018 and we hope to see you all in March for another great event ! As always, the very best of luck in finding that special item for your collections ! From all at the Preston Arms Fair….. The August 13th Fair started with a queue of 80 plus visitors waiting for 9am and the door to open ! Once again the footfall was excellent and for this fair we had several new Dealers/Collectors taking tables. Many dealers said they had enjoyed excellent sales and very many visitors also said to us that they had purchased superb items, we notice that there are now many visitors from north of the border who have started to visit our fair on a regular basis. Please see the photos of this fair, all tables were taken and the range of collectables were really superb. The Dealers £50 raffle was won by Steve Robinson, well done Steve, nice display ! All the best from the Preston Arms Fair Team ! The weather as usual was cold and rainy befitting most of our Bank Holidays ! Despite this the fair was very well attended and you can see in our photo gallery many of the dealers tables attracting lots of interest, the waiting list for tables has grown and we may well expand the fair in the near future. Many visitors and dealers reported a very good day with a lot of militaria being brought to the fair by Veterans or their families which, of course, is a great way to acquire items that have never been in a collection. Our next fair will be on Sunday the 13th August 2017 and we hope to see you all there , and as always drive carefully and the best of luck with your search for that special item for your collection ! The first Preston Arms Fair of the new year was a resounding success with all tables being taken and with a growing waiting list from dealers wanting to attend the fair, this together with the most visitors we have ever achieved made the day a memorable one. In line with our advertising policy for the fair we have re-booked all of the magazines from last year, the latest one is the “History of War ” an excellent publication, and not forgetting the superb “Black and White ” which lists all collectors fairs in the U.K. We believe that our fair is the most advertised collectors event in the U.K.
For pictures of the fair on the 5th March 2017 please visit our Gallery. The winner of the Dealers Raffle was Mick Stott, well done Mick ! 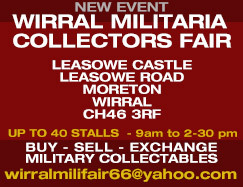 Following the success of the new Militaria Fair on the Wirral at the Leasowe Castle we are pleased to advertise the second fair which will be held on Sunday the 23rd April 2017.